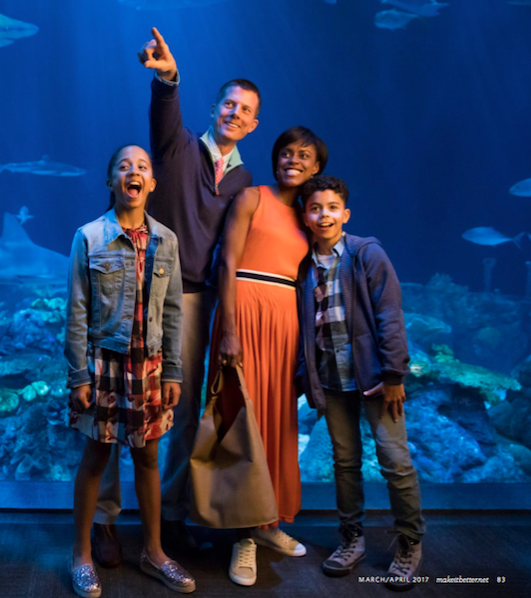 The March/April issue of Make It Better is now available in which I styled the Fellows family for a photo shoot at the Shedd Aquarium. I want to share the photos with you to show you easy form-meets-function Spring fashion for the family and give you evening wear ideas for any of the Spring galas you may be attending. Exploring and having fun should be at the top of your list during your family day, not complaints about sore feet or feeling uncomfortable. Dress your family in breezy and breathable soft fabrics of plaids and prints in playful colors with comfy-yet-chic sneakers. Be bold with a vibrant colored dress that has a stunning feature – like your sculpted shoulder – and pair with unique, yet fun, shoes. 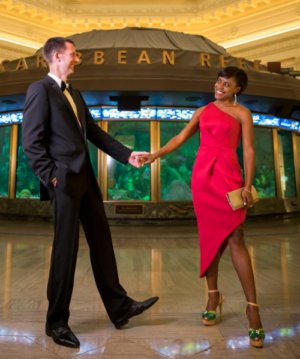 Dress your partner in a timeless tux to keep the overall look classic. For more information on the clothes featured, see page 86 in Make It Better.